It has been said that if you love what you do, you'll never work a day in your life. This is what is known as a truism. In other words, it contains a grain of truth. The saying compels one to follow ones instinct, and trust not only what feeds your bliss but what others may have to offer about what they think your gift(s) are. Art has always been an enjoyable exercise for me. As far back as I can recall, drawing and painting images on a variety of surfaces has been appealing because it usually produced a result I could be satisfied with; And surprising to me was that feeling of accomplishment. Later on, through discovery, experience and wisdom the wheat from the chaff began to divide. One could produce imagery that did not take much work to produce, and could render an absolutely stunning result. On the other hand, one could work slavishly and render a comparable result. The whole ordeal of art is about this process of compiling an outcome to produce and income, so as to produce more, better and different outcomes. Painting rocks has rendered some stunning outcomes with a mix of ease and comfort. Some days I am not so lucky. These are the days when I count on both inspiration and perspiration. My academic training has paid off here because, I can do what others have done before me ( i.e. seek inspiring images, new mediums, methods and/or materials) Who would have thought that choosing a variety of surfaces, mediums and materials could be such a pleasing activity to further ones creative process. Below is this weeks rock of the week. How can I use my rock? Okay, So you have purchased a Spirit Rock. How can it be of use to me or someone else. I am asked this question from time to time. One of the best uses for a rock is to have it as a talisman. In other words, a meditation device. Many will hold it in their hands as they settle their mind and begin to focus. An affirmation sheet is included with each rock sold. The other way the rock can be used is as a placeholder, after finishing a chapter in a book. When you put it on a night stand, it makes a comforting night light that softly fades. Children like this effect, especially if they are afraid of the dark. Usually a little black light can keep them busy, highlighting the colors on the rock before they doze off to sleep. Another use for the rock is to have it on your window sill or by the door as a way to remind yourself of something before leaving your home for the day. Some will keep one by their computer to refocus their eyes after viewing the monitor for a while. 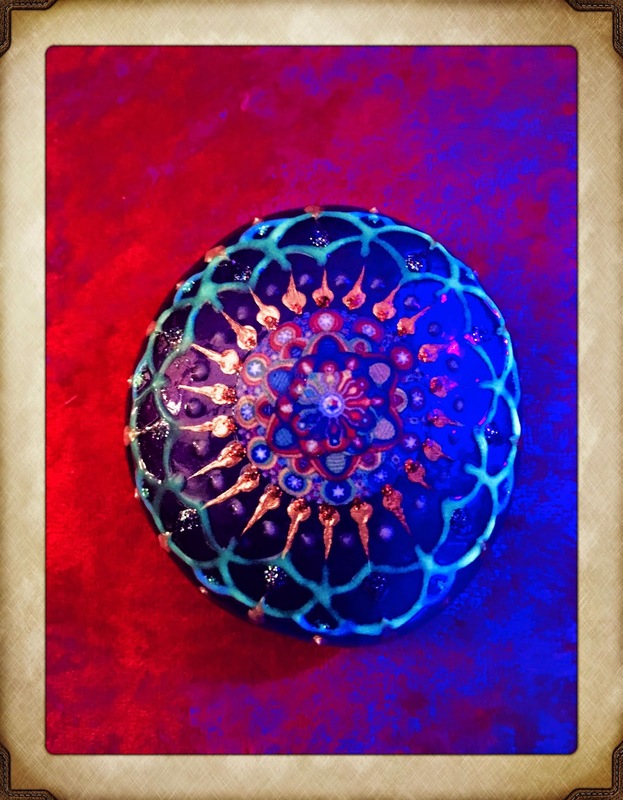 It just is a colorful item to uplift your spirit every time you view it. If you can think of other ways to use these rocks, I am always open to hearing your suggestions. 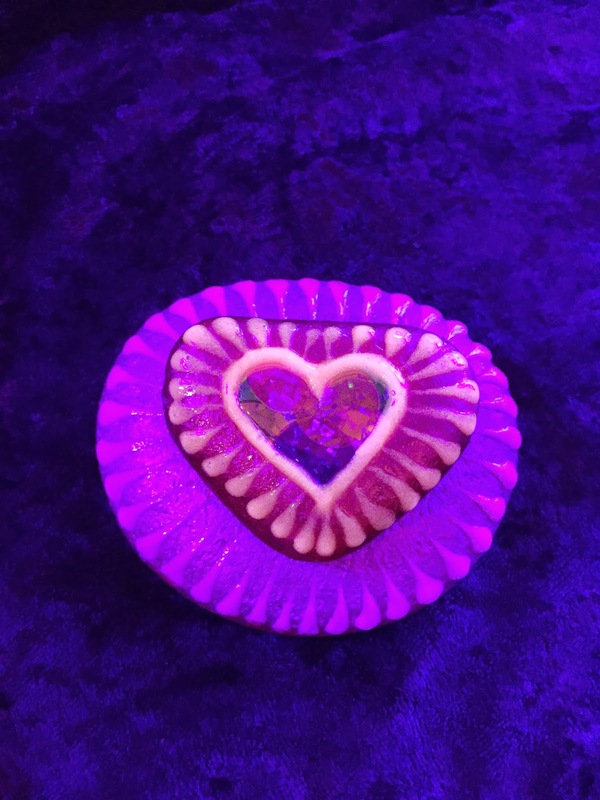 This is a stacked, heart-shaped rock with a metallic mylar heart adhered in the middle with glow in the dark paint droplets surrounding it. This is a project I've been working on for some time. I am trying to get it ready for Valentine's day 2015. 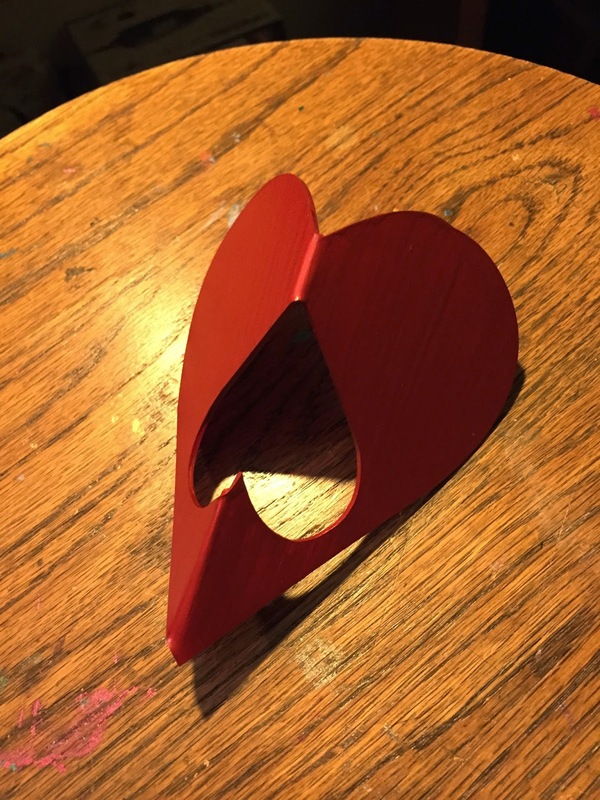 Basically, it was a flat piece of carbon fiber that I had die-cut into a heart shape with an inverted heart shape cut out of the middle. The next step in the process was bending the whole shape right down the middle at a 90˚ angle, so that it would lie flat on a horizontal surface. The bending of the shape and the size of the inverted heart was problematic. I tried bending it over a coat hanger, softening it in a low heat oven, taking a heat gun to it, etc. I have finally found a solution that seems to work pretty well. 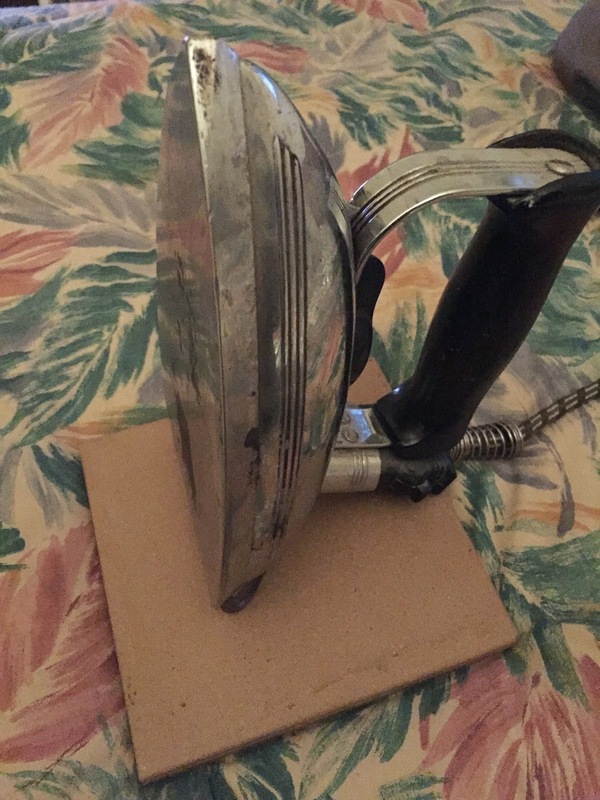 I have an old flat clothes iron that heats slowly and uniformly ( important ). I take the heart shape and hold it on the edge of the iron until it gets soft enough to bend, and Voila ! I have my rock holder.